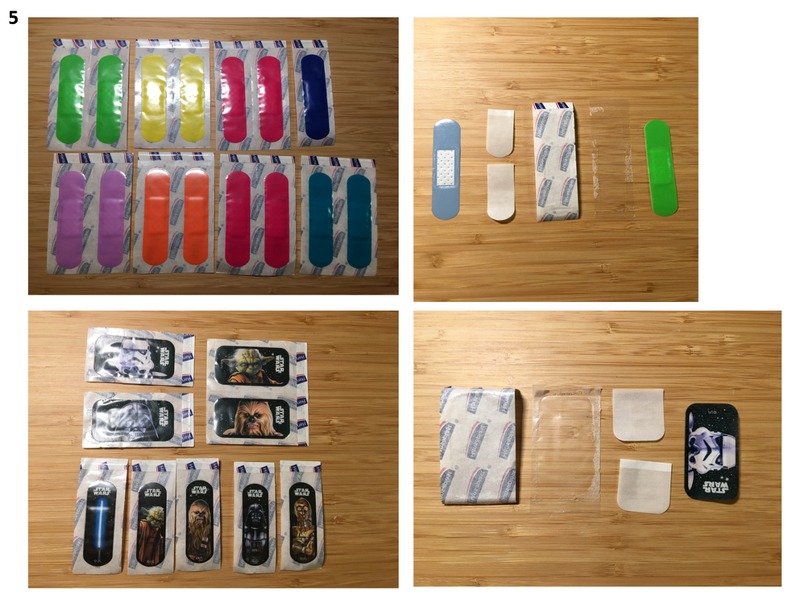 Exploring the realities of buying and using single use plastic plasters, and any tensions this creates for ecological values. When I introduce myself to people, it is likely that the words ‘health’ and the ‘environment’ crop up in the conversation. Mainly due to the fact that, in addition to my day job, I have co-founded a not-for-profit organisation called #PersonBeforePatient. Its an organisation that is exploring what it means to be healthy? Not just healthy in a conventional way of thinking (ie. physical and mental/emotional), but from a wider societal, economic and environmental perspective. We want to tell the story of health. Since co-founding this organisation, I have found myself re-focusing my understanding of what constitutes ‘environmentally healthy’. The impact of this has caused me to sharpen my own behaviours, and to question more. The audit report featured findings from hospitals in Indonesia and the Philippines, and proceeds to demonstrate the volume of plastic in the hospital waste stream. Addressing a series of recommendations to hospitals, governments and the healthcare industry. It’s an excellent read. Despite its excellence, when I first read the report, I struggled to connect with the contents and findings. Predominately due to geography — both in location and setting, but also because my focus has always been more centred to individual health and personal responsibility. Personally, I felt overwhelmed by the challenge ahead in the healthcare setting. I also could not imagine an acute medical setting where plastic was even noticed. While this confirmed my theory that plastic was not even noticed in an acute medical setting; I knew that there were some circumstances were plastic was in view, but maybe not in vision. An example that springs to mind is the collection of, or transfusion of blood, however, questions and concerns have previously focused on the perceived ‘cleanliness of the blood’ rather than the biodegradability of the blood bag. Likewise, there are groups who already do refuse acute medical care based on their beliefs, and in recent years we acknowledge ‘orthorexia’ — a group of individuals who’s health is being damaged as a result of their extreme clean eating diet. Therefore with the emerging polar-positions regarding climate change. Those who believe and those who don’t. It is not beyond the realms of possibility to imagine a future scenario where an individual with a firm ecological and sustainable value set refuses acute medical care due to the use of plastics in the hospital setting. Healthcare without Harm, in their recommendations do not include the individual, remaining focused on addressing hospitals, governments and the healthcare industry. A stark contrast to the individual movements which do target corporations; the plastic protests at Albert Heijn, as an example. I suspect the right answer is a combination of all three players, but when it comes to health, I am not entirely sure we actually know what we are dealing with. Caring for one’s health is not just in a formal healthcare setting like a hospital. It happens daily behind closed doors. How does plastic really feature in day to day healthcare and how are we as inviduals connected to these issues? Enter the humble plaster: sufficiently mundane to be rarely in one’s mind; yet so useful we are lost without it. My research for this paper started at home. Myself and my family. I am ecologically minded. My credentials: I recycle plastic and paper. I have worked in the healthcare industry for approx. 15 years, yet I have never given the plaster so much as a second thought. For me it is a tool of convenience. Predominately used with my children. I can not recall the last time I used a plaster for myself. As a parent to two young children — a boy aged 5years, and a girl aged 6 ¾ years — once I started thinking about plasters, they seemed to be everywhere! Deciding to collect them together, I discovered that I had a large collection of plasters [approx. 50]; they were scattered all around my home. In bathroom cabinets, in drawers, in the kitchen, amongst the children’s toys and at the bottom of bags. The only place they could not be found was in the family’s first-aid box. I also discovered that I, as the parent, was not the only member of my family using plasters. Both my children had toys with injuries and had regularly been administering first aid. When I asked a little more about their first aid knowledge, I was reminded of their annual visit to the VUMC’s teddy bear hospital, where they learn about x-rays, and ‘using bandages (plaster cast) for a broken arm/leg’. The majority of plasters [image 1] collected in my home were branded Hansaplast. Hansaplast is made by Beiersdorf AG, a company registered in Hamburg, Germany. Initial observations indicated that I have previously purchased plasters in the following categories: themed; special feature (i.e. waterproof, for sensitive skin) or purchased in a different country to The Netherlands (i.e. on holiday in France). I also noted that a number of boxes were duplicate and unopened. One of the boxes not only contained plasters, but also a tube of medicated cream [image 2]. All of the plaster boxes contained instructions for use. In the case of the branded boxes, the following language was also used [image 3]. Many of the sources consulted online, suggest that there is misunderstanding amongst the public as to what symbols on packaging actually means. As both of the themed/branded plasters are advertised for children, I was keen to explore this more. [image 4 from left to right]. CE marking is a certification mark that indicates conformity with health, safety, and environmental protection standards for products sold within the European Economic Area. A number 2 in a circle with a diagonal line going through it, means the items is single use only and should not be reused. ‘The Green Dot’ (despite usually being black and white). A symbol used to signify that the company has contributed financially to a plastic recovery and recycling scheme that runs in some European Countries (not the UK). This symbol does not mean recycling. International symbol “Tidyman” used on packaging to remind people to dispose of it in a bin instead of littering. PAP recycling symbol suggesting that the box can be recycled. Specifically, people appear to be confused by the symbol for recycling, and the green dot (as an example). 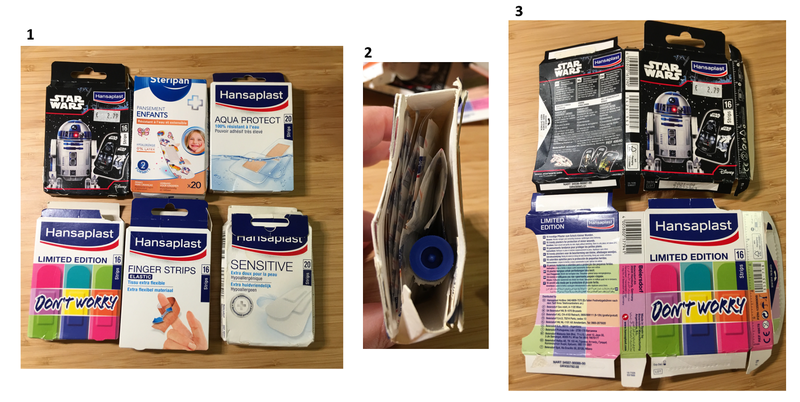 While the outside of the boxes suggest levels of sustainability either through the source of the packaging, or the ability to recycle the box after use, the plasters contained within the box, tells a different story. A story of single use plastic. Each box contains 16 individually wrapped plasters. The wrapping for each plaster appears to be, on one side ‘coated paper’ and the other a thin layer of plastic. This wrapping keeps the plaster sterile. In the case of the two examples featured in [image 5], the adhesive sheet is a plastic (possibly PVC, polyethylene or polyurethane) and the absorbent pad is likely to be cotton with a coating, which keeps it sticking to the wound. In order to confirm this analysis of the plaster, I searched www.hansaplast.com for an ‘ingredients list’. This was not available; neither was information provided about the disposal of the plaster. What does a plaster do? What is its job? Starting with the definition of a plaster (noun) plas·​ter | ˈpla-stər is a medicated or protective dressing that consists of a film (as of cloth or plastic) spread with a usually medicated substance. adhesive plaster — broadly : something applied to heal and soothe. Is this understood? My conversation with my son, aged 5years suggest yes. Q. What are plasters used for? A: When you have got, hurted yourself. Q: When you have hurt yourself? A: Yeah. Q: What do you mean hurt yourself? A: Blood … or you can have them for a bruise. Yeah, sometimes I got blood or a bruise. Q: So what happens, what happens when you put a plaster on? A: It not hurts …only a bit. So that why … when somebody hurt …broke their leg. Q: Is that the same kind of plaster as these ones, or a different one? A: Uhmmm … you need a bandage. Q: What are these in front of you .. are they bandages … are they different? A: They are little and the bandage are long. Q: What are plasters made of? A: I don’t know …..paper and sticky tape. Q: Can you use plasters more than once? A; Yes… no… a lot of times you can use them … lots of time. He talks about the healing power of plasters. Once a plaster covers the blood or the bruise it stops hurting. This is echoed in the advertising for Hansaplast STARWARS plasters which claim they ‘perform miracles because they quickly make small accidents easily forgotten’ and ‘immediately send tears to the milky way far away from here with these exciting plasters’. A plaster is also like a badge, in the eyes of my son. Showing likes and preferences as well as being a symbol of an event. He went on to imply that he understood the plaster to tell a story, or at least a prompt for a story. A story which has a number of short-cuts, universally understood circumstances which don’t need to be explained. The visibility of a plaster implies an event, an injury which is understood to have accompanying pain, and emotion. The injured individual is only required to provide specific details which contextualise the event. For my 5-year old, this gave the plaster a job of being a ‘badge of honour’. Given that my son’s social circle predominately comprises of individuals who take a ‘care-giving role’ and will prompt conversations about his wellbeing in some form or another, I wonder if this perspective also applies to older children, and even adults. What options are available to an individuals who not only wants a ecological plaster, but also a plaster which blends to skin tone. What are the options? Is it possible to live a zero-waste life and use plasters? ‘when it comes to medical, you need to accept a certain degree of waste. Keeping you and your family’s health in top form is the number one priority. Don’t compromise on quality of treatment’. ‘I think reusable band-aids would be more trouble than they are worth. You don’t want to risk infection”. ‘this one is difficult. I’ve had to make peace with medical waste which for the most part is unavoidable, and concentrate on other areas of consumption. Band-aids, though, might be avoidable just by washing small wounds carefully, applying pressure to stop any bleed and leaving to open to scab…which is the body’s own form of bandage’. 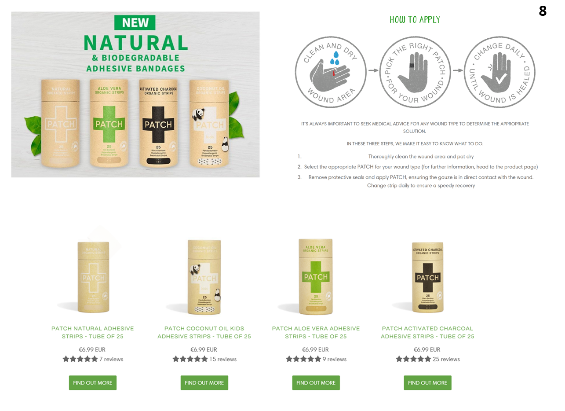 In 2016, Tammy (of GIPPSLAND UNWRAPPED) posted an article on-line which not only outlined her ecological values, her frustrations at the limited biodegradable plaster options available to her; but also provided a series of suggestions for alternatives. The first being the use of ‘scrap cotton fabric that can be cut to size and either knotted around a body part or secured with a reusable rubber band, bit of surgical paper tape or biodegradable string’ [image 6]. The second being dried Kombucha Scoby(i) which has the added value of ‘being compostable after use’. A more contemporary perspective is offered in 2018 by Green Matters. This article, which also recommends DIY Kombucha Scoby, but first explains the issue with plasters and why they do not biodegrade. An interesting tension developing through this perspective, the tool designed to protect our bodies from infection in turn, through the way and materials use to make it, becomes harmful to not only the planet, but also our health. Not far from any of these conversations and perspectives lies a discussion which questions the need for plasters at all. What is understood to be correct, ranges from ‘tales told by my granny’ to scientific publications outlining new research published by the University of Leeds, which has ‘identified the way nature creates its own plaster to try and prevent bacteria and other micro-organisms from penetrating open wounds. A bio-film forms as part of the natural clotting process and provides protection for at least 12 hours, giving our natural immune system to deal with any presenting infection. While, the future of the plaster industry may be impacted by these new insights and the plaster may become a medical tool only for individuals with a depressed immune system, or a clotting imperfection, there continues to be a vibrant ‘nutraceuticals and wellness’ market. It was within this field that I identified two companies — both of which based in Australia — who produce a sustainable, eco-friendly alternative to the single use plaster. What happens to plasters once they have been used? 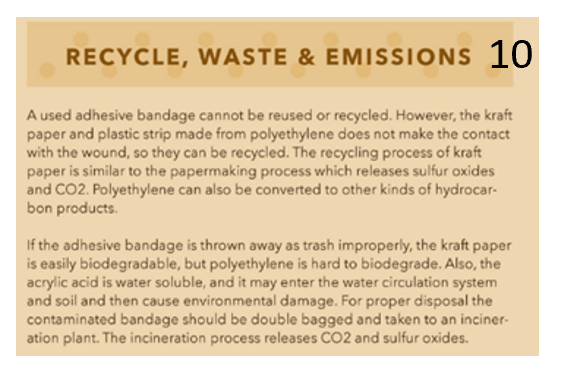 In the case of the patch strip, the Nutricare company clearly demonstrates its claim of biodegradability within a 10 week period. 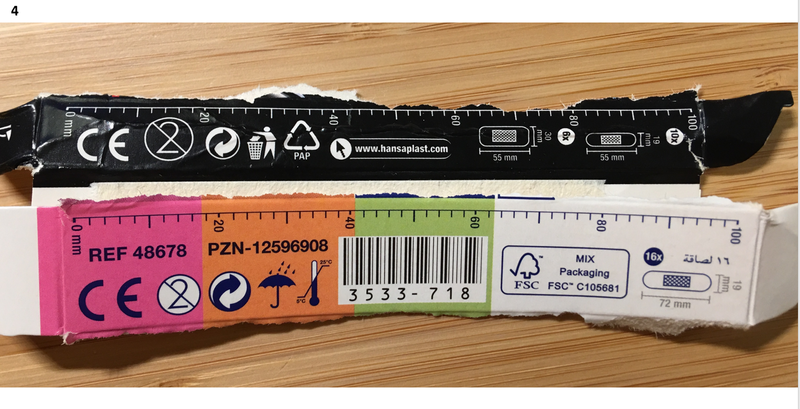 This sequence of images, also demonstrates what happens to non-biodegradable plasters. Nothing! They continue to exist. The majority of plasters are just discarded after use. They are disposable. Observations showed that individuals, before discarding, fold the plaster into itself — the adhesive layer folding over the absorbent pad which covered the wound — making it smaller and more ‘hygienic’. plaster will be folded into itself — meaning that any human waste (blood, ooze, pus) is covered by the sticky strips. Then placed in a bin, in a pocket, dropped as litter. The point of interest for me is the distance between actual practice of plaster disposal and the language used in this paper in reference to ‘proper disposal’ — namely double bagging contaminated bandages and disposal at an incineration plant. I am curious about the criteria applied to human waste. On the one hand, in the hospital setting contaminated waste is a topic of the Healthcare without Harm’s report. It has specific processes to be followed in regard to its disposal. On the other hand, a plaster — with clearly smaller volumes of contaminated waste — is disposed of with no specific instructions from the manufacturer; and can become litter. Maybe like the plaster itself, the volume is too mundane to be looked at, against bigger and more pressing concerns? Unfortunately, neither of the examples used in this paper are currently available to me, and my children. The on-line ordering system for Patch Strips is user friendly but with shipping costs from Australia means that the €6,99 sale price for 25 strips quickly becomes cost prohibitive … the nearest local stockist is listed as being in Sweden. 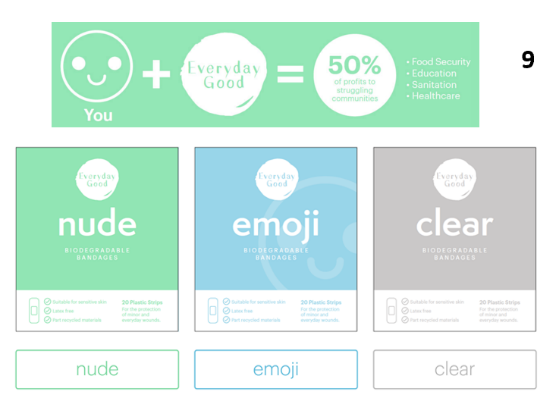 The Everyday Good Co does not sell outside of Australia. So, I spent a day plaster shopping in Amsterdam. I was looking specifically for choice — biological plasters, or plasters which implied a biological component. I wanted to explore what was available to me, given my eco-principles. My choices of shops [image 11] included a pharmacy chain, and supermarkets which ranged from the organic, to ones who had previously been criticized due to use of plastic. Ekoplaza and Marqt did not sell plasters. Albert Heijn, Jumbo, Etos, Kruidvat and Flying Tiger did sell plasters. I must note at this point, the discovery of plasters at Flying Tiger was accidental. I had not originally included it in my research. Given that the two supermarkets who are known for their eco-commitment did not sell plasters, I was hardly surprised by the offering from Albert Heijn, Jumbo and Kruidvat, and half expected to report back that in my humble opinion it was impossible to buy an eco-plaster in Amsterdam. There is an apparent contradiction on the packaging. The description references 100% organic cotton, yet under the symbol [of item of clothing] it references 78% organic materials. This is due to the fact that the sterile absorbent pad and the individual plaster packaging is not made from organic materials. From a texture perspective, the plaster is pleasing to the touch. In colour it is pale, untreated and is clearly visible against my skin tone. Further research time would be required to ascertain if this plaster will bio-degrade (ii). 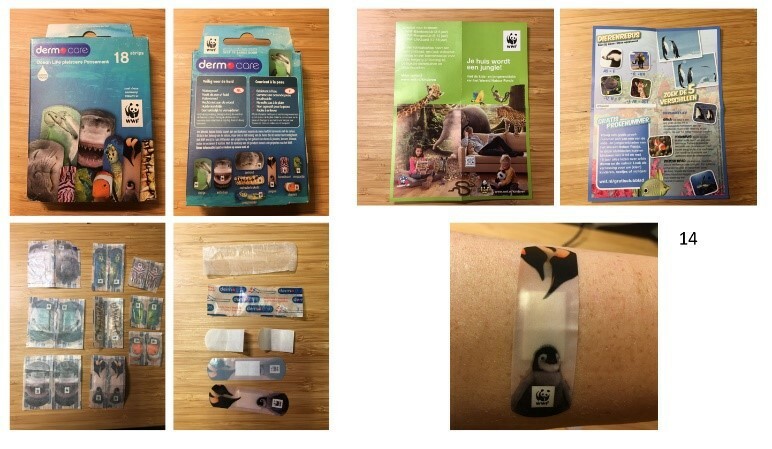 The Dermocare brand plasters are single use plastic with an image of an ocean life animal. Choice is provided, not only in size but also image. [image 14]. Each plaster colouring to skin tone is more aligned, but this is due to my choice of plaster. Others in the pack would not have provided this. The brand has an logo endorsed partnership with the WWF (World Wide Fund). The attached insert is predominately an advertisement for the WWF Children Club’s — Bamboeclub, RangerClub, Lifeguard Club — which provides education to children of differing ages. and is focused on education for children. There is also a cost attached to the joining of these clubs, which is paid directly to WWF. The partnership raised further questions. This product is predominately plastic. The WWF website provides 111 matches to the search term plastic. Each article referencing the dangers of plastic to animals and the need to reduce the use of plastic. These plasters were available in a number of the stores which stocked plasters. [image 15]. As is the case in many supermarkets, the products developed for children are lower down and in their eye-line. The entire row is titled ‘children’s plasters’ and features a variety of plastic plasters tailored to the interests and choices of young children. The image was taken in Kruidvat, a typically cheaper retail brand. 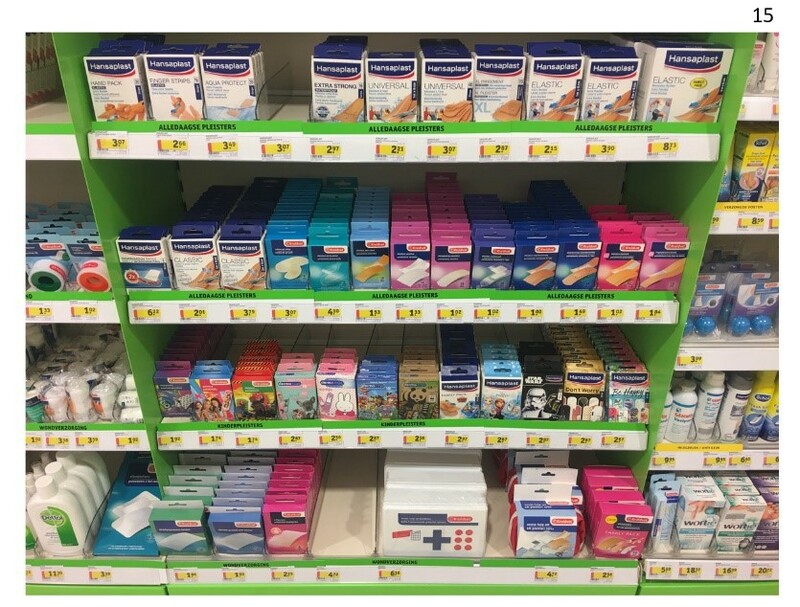 It is noticed there that there is no price variance between the various stores selling plasters. The brand of plasters states Latex Free, and positions itself as a option for ‘Greater Connection’. [image 16]. In the words of the company …Until today there were only plasters in one skin color in the Netherlands. Actually very strange, because everyone is equal, but not everyone has the same skin color and cannot stick the plaster of his or her choice. HeltiQ is working on this in collaboration with the NASF (Dutch Albert Schweitzer Fund) by introducing plasters in several skin colors. An initiative with a double function, because by buying a box of plasters € 1 goes directly to Africa and you support The Greater Connection by the people there, for whom a plaster or other basic medical facilities are not at all self-evident, to assist. The brand is the most costly to purchase at €4.10 for 24 pack, but €1 of the price is donated to the Greater Connection initiative. But given the positioning of this brand, it also is the pack which could create the most wastage. The pack contains 6 different colour options (4 individual strips of each). As seen in [image 16] there is only one match to my skin tone, therefore I question what use I would have for the remaining 20 plasters if I had purchased them for the advertised use. I choose to hold ecological values. This is my decision. The extent of how wide reaching this decision is, is based on availability of the products that fit within the constructs of my values. 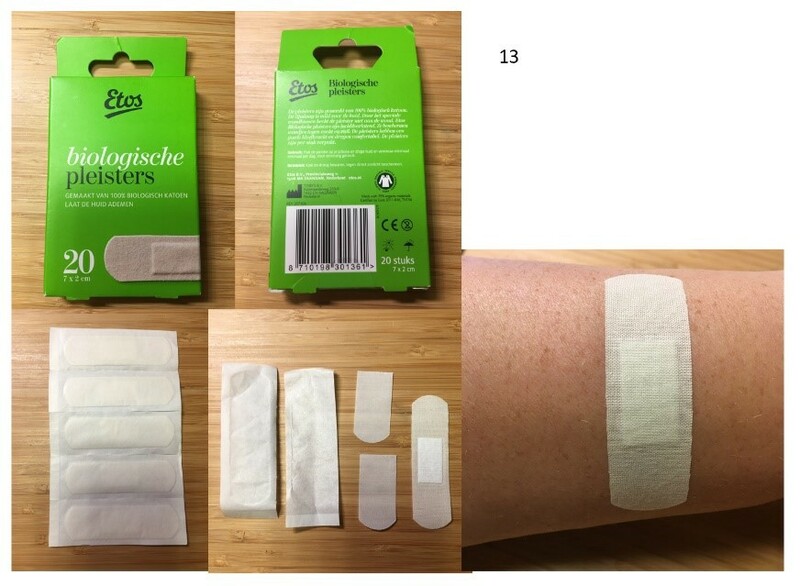 In regard to the topic of plasters, the majority of my research focused on defining what plasters would meet my definitions of ‘being-eco’, and then the availability of the plasters in the city of Amsterdam. This blurring of language and perception is demonstrated by the Democare Ocean Life the WWF partnership. A clear short cut to implied eco-values disguised as single use plastic. The borrowed credibility and trust blinds the purchaser to the sale of plastic. Plastic which, due to its lack of biodegradable abilities, will contribute to the destruction of the sea life populations featured on the plaster. There is also confusion about what we are seeing — the symbols on the boxes of plasters, which is normally is paper based can be recycled. As plasters are a purchased product of depth, can be not see the multiple components. Do the symbols of trees and recycling arrows featured on the external packaging meet our needs to not question further and explore the contents. Or does the acute scenario nature requiring the use of plasters overtake all rationality. The parents I spoke with suggested it did — a vital tool at the time of use, but then forgotten. To mundane and no questions of an alternative. This was also confirmed by a parent who stated that in an acute setting, the focus was purely on the event in hand, not the equipment — plastic or not — being used. A crying child takes priority to eco-values. I started this research in my own home. I now have a large collection of unused plasters — helpfully, now in one place — and I have discovered the availability of the Etos Organic Plaster. At this point, I do not know if it is as biodegradable as I would hope for, but it’s the closest thing to an eco-plaster that I have found in Amsterdam. So what do I do now — I have a collection of plastic plasters and one box of organic plasters, I have discovered no acceptable method of disposing of the plastic plasters so I am faced with a tension. Do I use them or discard them. As with most things, ignorance was bliss, a little knowledge raises more questions that it has answered. As with so many elements of life, “individual choices will most count when the economic system can provide viable, environmental options for everyone — not just an affluent or intrepid few”. In Going on an Eco-plaster Hunt. Part II & III I will undertake some more experiments; predominately assessing biodegradability over a 10 week period, in order to compare plasters available in Amsterdam and those manufactured in Australia. I also plan to meet with manufactures in order to understand further the process of making a plaster and investigate further the impact and methods of disposing of used plasters. (i) Kombucha is a fermented, slightly alcoholic, lightly effervescent, sweetened black or green tea drink commonly intended as a functional beverage for its supposed health benefits. Sometimes the beverage is called kombucha tea to distinguish the name from the kombucha culture of bacteria and yeast. “Scoby” is actually an acronym: Symbiotic Culture Of Bacteria and Yeast. … A scoby is the living home for the bacteria and yeast that transform sweet tea into tangy, fizzy kombucha — think of the scoby as the coral reef of the bacteria and yeast world. It a rubbery raft that floats on the surface of the kombucha. (ii) Criteria for Biodegradability: Biodegradation is the chemical dissolution (dissolving) of materials by bacteria or other biological means. Once a product has biodegraded, it essentially “disappears”. These products can be solids biodegrading into the soil (which we also refer to as compostable), or liquids biodegrading into water. Nature biodegrades everything it makes back into basic building blocks, so that new living things can be made from the old. Every resource made by nature returns to nature — plants and animals biodegrade, even raw crude oil will degrade when exposed to water, air and the necessary salts. A leaf is a perfect example of a biodegradable product — it is made in the spring, used by the plant for photosynthesis in the summer, drops to the ground in autumn and assimilated into the soil to nourish the plant for the next season. This process will take about a year. If a fabric or product is biodegradable, you can determine several things. For a start, it means that the material is made of natural materials, such as wood, cotton, or linen, or artificial materials that are similar enough to plant and animal matter. Biodegradable plastic, for example, will be comprised of a natural ingredient such as cornstarch or vegetable oil. It also means that the material will break down over time, into the chemicals that it was originally composed of. When a manmade compound is formulated in a laboratory, combinations of elements are made that do not exist in nature and there are no corresponding microorganisms to break them down. The Wilson Lab. BV. Human Centred Responses To Societal Health Challenges.